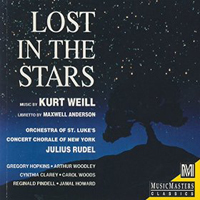 Studio Cast, 1993 (MusicMasters Classics) (4 / 5) As general director and principal conductor of the New York City Opera in the late 1950s, Julius Rudel rescued Lost in the Stars from obscurity by introducing it into his company’s repertoire. Thirty-five years later, Rudel conducted this definitive recording of the beautiful Weill-Anderson score. Leading the Orchestra of St. Luke’s, he utilized more musicians than Weill ever envisioned, and he searched the worlds of opera and musical theater to find a dream cast. Notable among the vocalists are Arthur Woodley, who not only sings exquisitely but also brings poignancy to Stephen Kumalo’s Act II soliloquy; Cynthia Clarey, who renders “Stay Well” and “Trouble Man” with tenderness; and Carol Woods, who belts “Who’ll Buy?” with flair. But the true stars of this recording are the members of the Concert Chorale of New York and tenor Gregory Hopkins as chorus leader. 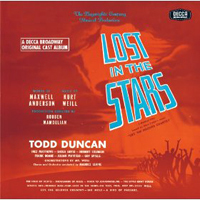 While the original Broadway album retains considerable historical interest, the superior vocalism and the ample orchestral sound of Rudel’s studio version eclipses the earlier release. — C.W.